Boston's City Landing is across from Marriott Long Wharf and down the block from ferries that will zip you to P-Town. Outside, miss not a minute of tourist central with concierges, ferry blasts, street vendors, the Rose Kennedy Greenway, Aquarium sharks and views of other people's boats. Inside, according to Worth.com last year, the aptly named City Landing is a power lunch stop. It's Sunday, there don't seem to be any deals in the making but if you want to show me the money, I'm in. We understand you're sightseeing at Faneuil Hall but eschew fast food and come over for real lunch. This is summer in the city fine dining even in sneakers. We're at the window with an eye on street drama of which there is plenty and though we cannot hear, we can read lips. 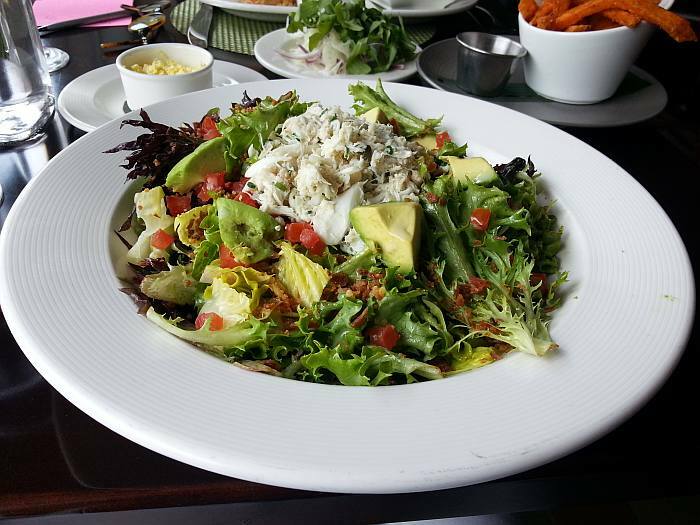 We're having lunch: Roseanna's crab salad is topped with avocado, egg, fennel, bacon and tomato. It's easy being green here. She's clever, ordering a side of sweet potato fries. 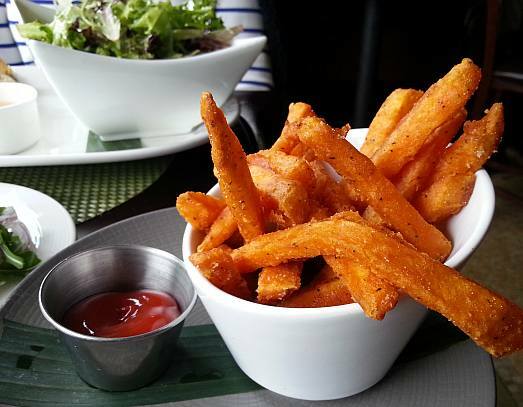 It turns out fries are the best and there are almost enough of them. 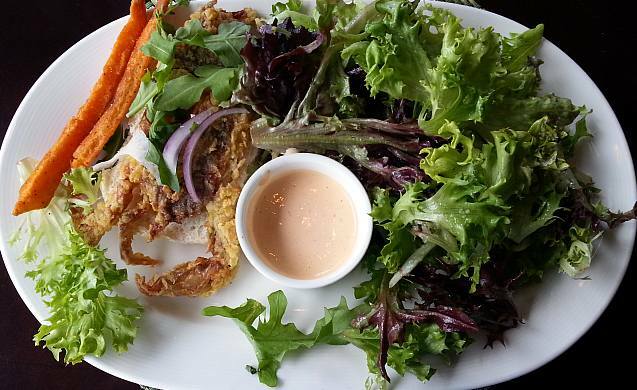 When I don't know what to have, which actually happens a lot, you can always get my attention with soft shell crabs. We had them as kids and then it was a short season, just August. Now they're served all the time and since I'm never going to make them at home again ever, what I want is a crab sandwich from someone else's kitchen. I remember them as being lunch but they're a snack. Yes, the crab is fine and yet I'm still hungry. What is it with industry trends? Today, it's whimsy with small portions on huge plates. In the 80s remember spangled dessert plates? Them I find very entertaining since I'm not clever enough to gussy up desserts or anything else for that matter at home. The 90s brought food towers and, as it happens, I like my food piled up though I'm not sure why. When a huge plate arrives without a tower, I'm so disappointed. This is lunch, it's also dinner. 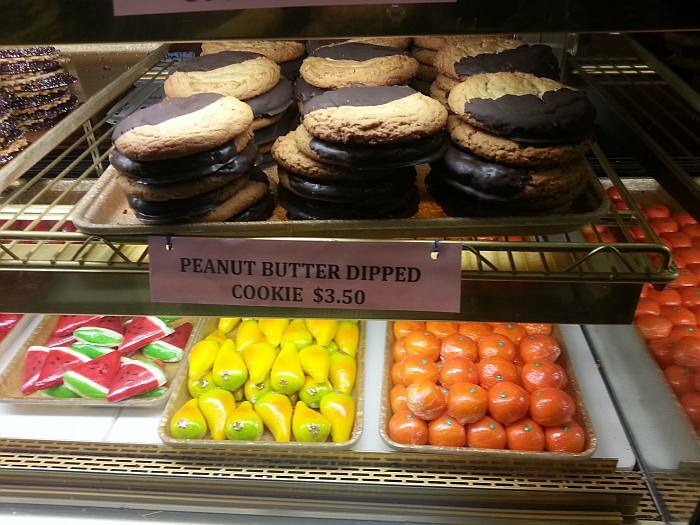 When you check City Landing's website, have Dramamine: plates in a slide show whiz by. Finally, we're in walking distance of Boston's North End. It's a 40-mile an hour wind along the harbor but we must see what's changed since last summer. 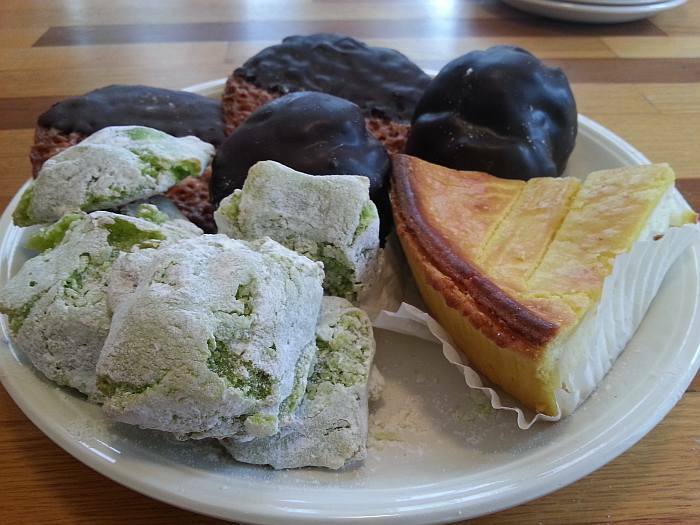 Know this: You're either a Mike's or a Modern fan and today we're on an out-the-door line at Mike's Pastry on Hanover Street. The place is packed. We wait our turn and Roseanna's now buying one of everything and the question is, can we get back to Chestnut Hill without opening the box? When you're waiting, there is always a wait, check all the cases and then the tables to see what everyone else likes. What I see is anything you could possibly want is here. Biscotti, cookies, pies, squares, rum cake, mousse cake, cheesecake, macaroons (not to be confused with macarons born in France, or macaroni from a box), bows, wafers, fingers and logs, ricotta and fruit pies, Rocky Road brownies, torrone, tarts, éclairs, cupcakes, twists and ears are all, every one, big. Do you really want a dainty cannoli? Almond paste marzipan fruit is psychedelically colored. We buy ricotta pie with a cornmeal crust sweeter than cheesecake, Florentines, pistachio cookies and Jim's favorite - lobster tail puffs with custard filling. The ones we happen to buy are covered in dark chocolate, because they look good, and later it turns out he really likes them without chocolate. I'll remember next time. It takes hours to drive home, or 30 minutes, and the car never smelled better. First out are Florentine cookies, nicely browned with chocolate. Their recipe must be flour, almonds, sugar, salt, heavy cream, unsalted butter and vanilla but knowing Mike's, there's also a secret. I'm hoping that because they have holes, they're low-cal but I don't think so and we decide to eat them standing up over the sink. Soft pistachio cookies are a green surprise; the pistachio is intense, chewy and nutty with a hint of salt. One of us tastes and the others inhale. Consensus: Mike's does it sweet. 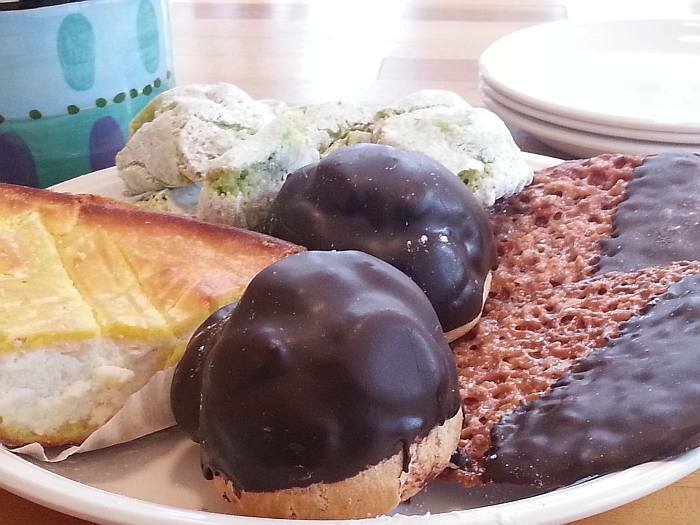 Absolutely no new-fangled trends here so don't be ordering gluten-free, low-cal, flourless, dairy-free éclairs. He's been doing it his way for as long as I can remember and my guess is Mike and Annette Mercogliano don't mess with 50 years of success now. Bring all your money and prepare to wait.